Rehydrate the dessicated coconut with water. Mix and set aside while prepping other ingredients i.e. 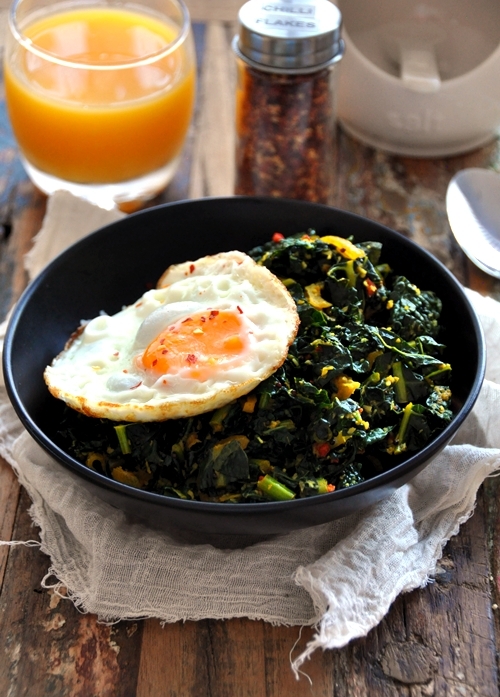 slice the onions, cavolo nero and chop the red chilli. In a large pan, heat 1 tbsp of oil with onion and mustard seeds over medium flame. Saute until the mustard seeds start to pop. Turn the flame over to low and add turmeric powder and curry leaves. Saute until fragrant. Add cavolo nero with 1/2 cup of water. Stir in coconut and chilli and mix to combine. Season with salt and serve immediately with rice and sunny side up eggs. Enjoy!